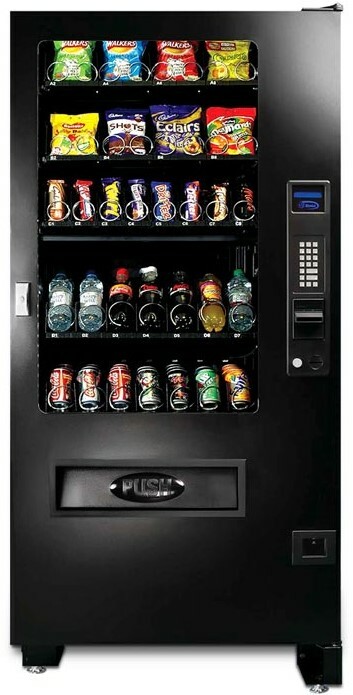 The SK5000 is a recent addition to the product range at CoreVend and provides consumers with the full vending solution. With a full glass front door and a fully refrigerated machine, each unit can be adjusted to vend a variety of products - cans, crisps, chocolate, bottles, sandwiches etc.. The machines are extremely simple to operate and would make a welcome addition to any site. - Extremely sturdy, all steel design combine for hard wearing durable machine. - Adjustable trays allow machine to be changed in an instant - from cans to crisps, bottles to bars etc..
- Vigilant Vend Detection System (Magic Eye) means no more failed vends. - Easily adjustable temperature control, can have differing temperatures for different trays. - Over sized product bin for larger products. For further information on the SK5000 machine, please click HERE and fill in your details.